TOPBOX - Still Have Questions? Call, Email or Leave Us a Message. 1. What storage options are available from TOPBOX? We provide 2 options: Mobile Self Storage (1 size) and on-site Local Self Storage (3 sizes). 2. What is Mobile Self Storage? With Mobile Self Storage, we deliver a TOPBOX to your nominated location for your packing convenience! After packing, we pick up the TOPBOX and store it at our facility. Click here for further details. 3. What is Local Self Storage? For Local Self Storage, you visit our facility to pack your belongings into a designated storage unit. There are 3 available sizes. Click here for further information. 4. What are the fees and charges for storage at TOPBOX? Click here to see the charges for the available options or call 1300 TOPBOX. 5. Are there any SPECIAL RATES available? Special rate is applicable to long term storage plan. Click here for further details. 6. What does “Storage Cost Per Cu M” mean on your website? At TOPBOX, size does matter! We provide you with more storage room for every dollar you spend! What is the weight limit I can store in mobile TOPBOX and how do I prepare and pack my belongings? The weight limit is 1000KG. Check out our Preparation Guide for loading your TOPBOX here. This is also displayed on the wall of every mobile TOPBOX. 8. What happens to my TOPBOX when it rains? Whenever a TOPBOX is outside of our storage facility, it is protected with a durable, weatherproof cover. It also rests off the ground to ensure that your belongings are safe and dry should it rain. 9. Is my TOPBOX secure in the TOPBOX storage facility? Absolutely! We DO NOT keep the keys to your lock. You lock your TOPBOX and only YOU hold the keys. Additionally, we have CCTV surveillance at our storage facility. We also undertake general fire audits and conduct regular pest control. 10. Where will my mobile TOPBOX be delivered? Your TOPBOX will be delivered to the location of your choice! You can specify the spot as long as the space can comfortably fit an average car. e.g. on the permitted parking bay in the street or in the driveway. For more details contact us. 11. What are the business hours and working days at TOPBOX? Note: Saturday is not considered as a working day for the purpose of giving notice. 12. How do I pay for my TOPBOXES? TOPBOX has integrated with an Australian Bank secure automatic payment system that allows you to pay by credit card or bank transfer. When you place your order, you will be billed the first month’s rent, deposit (if any), other applicable fees and any merchandise purchased. On the same date of each month thereafter, you will be charged the monthly rent by recurring direct debit. 13. Is my payment refundable? We understand that life can be hectic and that the best of plans change! We will happily refund your deposit/payment if you cancel either a delivery or a long-term storage plan, provided the necessary length of notice stipulated by TOPBOX is complied with. 14. If I empty my belongings at TOPBOX storage facility, what are the fees/charges? For Mobile Self Storage of less than 6 months, a single check-out fee of $59 will apply when you end the storage and collect the contents of your TOPBOX from our storage facility. This check-out fee is waived for contracts in excess of 6+ months. For Fixed Self Storage, no check out fee is imposed. 15. How much time do I have to load/unload my TOPBOX? We generally allow 48 hours for you to load or unload your TOPBOX at your leisure before pick-up. If you need more time, please call us. 16. Can I get help to load the TOPBOX? If you need help, please contact us for information. 17.  Are there any items I cannot put in my mobile TOPBOX or Local Storage Unit? 18. How do I insure my belongings in my TOPBOX? 19. Do I get better rate if I rent more than 2 TOPBOXES? 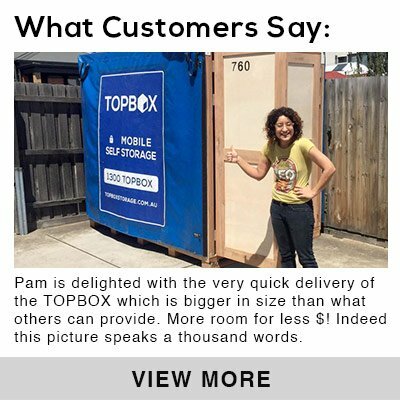 Please contact us on 1300 867 269 or email info@topboxstorage.com.au to discuss rates. 20. What happens if I don’t get my TOPBOXES packed in time for the scheduled pick-up? Simple! Call us to reschedule but please give us sufficient notice and we will do our best to accommodate you. There may be fees payable in certain circumstances, Click here for an explanation of what these charges are. Alternatively, feel free to book in for access and continue packing at our facility! 21. How do I organize re-delivery of my TOPBOXES and how much notice do I need to give? Simply fill in our quick online re-delivery request form available on our website here. Our team members will confirm your re-delivery requirements by email. To avoid any disappointment, please give us at least 5 business days notice for the return of your TOPBOX. 22. When can I access my TOPBOX and what do you mean by 24/7 access? For Mobile Self Storage, 24/7 access is available. However, you need to give us at least 1 business day’s to bring your TOPBOX to a designated loading bay. Please click here to fill in the access form. We will provide you an entry pin code to enter the compound. Then proceed to the loading bay number where your TOPBOX is placed. For Local Self Storage, we will provide you with an entry pin code on registration, so you can access your storage unit 24/7 without notice. Gate will shut automatically after entry. When you are finished and have locked your TOPBOX or storage unit, exit through the gate by entering the pin code on the keypad mounted on a pole on the side of the exit driveway. Please note that access is granted provided that your payment is not in arrears. If your payment is in arrears, access will be denied, and the pin code made ineffective.